Sentiment analysis involves algorithmically determining if a piece of text is positive (“I like cheese”) or negative (“I hate cheese”). Think of it as Kurt Vonnegut’s story shapes backed by quantitative data. I'm beginning to understand why Bible study sometimes creeped me out. 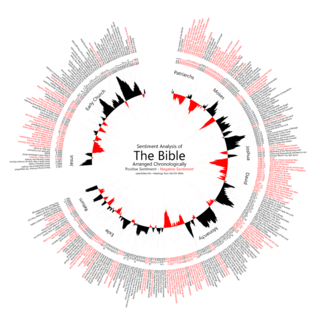 This entry was posted in Interesting, Religion and tagged bible, sentiment analysis on October 24, 2011 by Jon Lowder.